Michael C. Hall is the latest headliner to step into the golden boots over at the Tony-winning revival of Hedwig and the Angry Inch, and it’s an acting event that can't be missed. Below, BroadwayBox chats with Hall about creating his latest character and the real-life rock gods that manifest themselves in Hedwig. “Hedwig’s story is the same for every actor who is lucky enough to be inhabited by her; how that expresses itself has to do with whatever internal alchemy happens between that story and the actor’s story, body and voice. I don't know I have any objectivity on how it will manifest itself. She names a lot of the influences: certainly the trinity of Lou Reed, Iggy Pop and David Bowie; there’s some Tina Turner in there. I think she wishes she looked like Debbie Harry. I wouldn’t rule out anything; she is a singular creation. 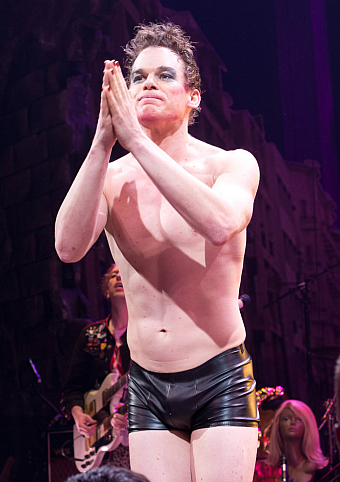 Michael C. Hall’s electrifying star performance in Hedwig and the Angry Inch, will be on Broadway’s Belasco Theatre through January 18, 2015.